Three weeks ago today I received my evaluation BlackBerry 10. To say the least it has been everything I expected of a device with the promise of true multi-tasking and powerful mobile hardware. In a recent post I mentioned several reviews that go into extensive detail and gave it good marks for its performance. Here I will focus on a few specifics of my own user experience. A week ago, I wrote my initial post based on my own experience: BlackBerry 10: First Impressions I–Display and Share. Today I want to cover the touch keyboard and the browser. One is a case where BlackBerry offers an entirely new user experience; the other improves (immensely) the previous user experience with browsers – no spinning hourglass! Touch keyboards have not been “my thing”. I took “typing” (now called “keyboarding”) in high school long before there were PC’s and smartphones. My fingers are too big for consistently accurate keyboarding on the iPhone. 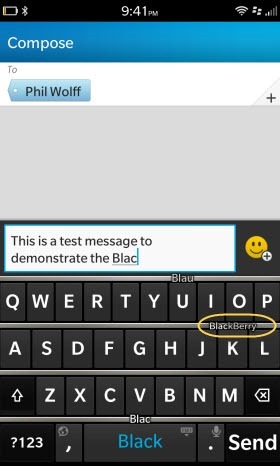 So, of course, as a veteran user of legacy BlackBerries, I am supposed to be “awaiting” the arrival of the Q10 with the physical keyboard. However, little did I realize the power of QNX and the hardware to deliver a new keyboarding algorithm. Predictive text changes the game. 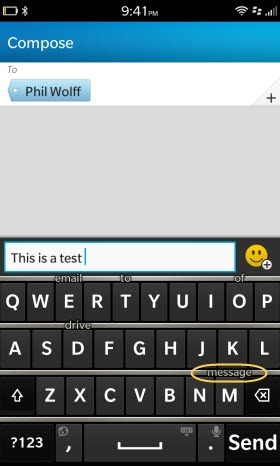 Start typing and suggestions come up above related keys. It learns what you type frequently; so now it includes suggestions of personally frequent words such as my website address and email address if it thinks I am headed that way. It significantly reduces spelling errors/corrections. Once the word you want starts to appear in the suggestions just flip it up and save the risk of typing mistakes. Start to type “Http”; you may get “http://” for a suggestion. But looking at my past history when I type it I am offered three different full website names that I have frequented. Website URL’s and email addresses are changed to active hyperlinks. Phone numbers turn into active call buttons. One key point: you must flick up the letter “key” below, not the suggestion itself to capture the desired word. Diehard physical keyboard users will have the option of the forthcoming Q10 but at the sacrifice of a true 720p display – which, as discussed in my previous post, gives stunning HD video and picture quality. BlackBerry 10 is designed for gestures and swiping, clicking and a full screen display. 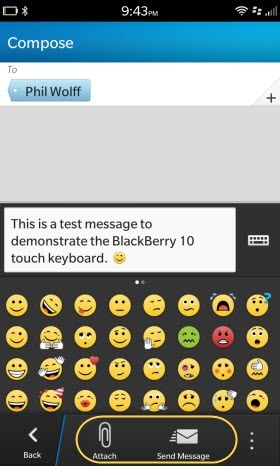 it’s no doubt the Q10 won’t be a let down, but one of the most pleasurable experiences about the Z10 is everything you do in blackberry 10 feels flawlessly designed for a full touch device. One suggestion re the keyboard: occasionally I find that I have accidentally hit the Send button when attempting to enter a letter/number near the Send button (N, M,<-, for example). It would be helpful to have an option to “Confirm Send” so that a partially complete message is not sent out. 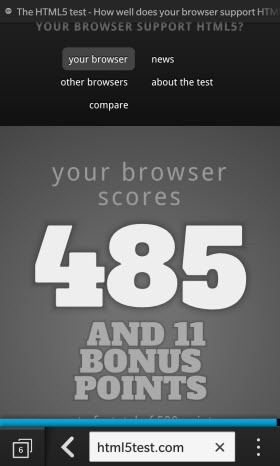 My major aggravation with the legacy BlackBerry was the browser. Often it was slow to come up, was missing elements on the web page; most importantly it was not reliable for bringing up a website. Some, such as PGATour.com always popped up, but others just could not make it. Not a satisfactory experience. 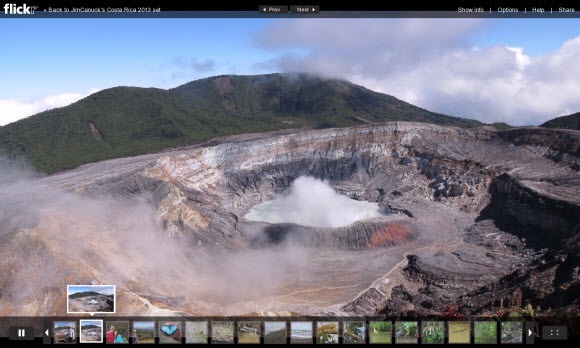 It was somewhat better on the iPhone and Android devices but again it was not near the browsing experience of a PC. In practice it shows. Click on a link in an email, text message, Twitter, Facebook or LinkedIn and you’re quickly at the targeted web page. Here is where speed plays a huge role. I will often browse through Twitter messages or the Facebook news feed; when I see a desired link I pull it up, take a look and decide whether I want to continue reading or return to Twitter or Facebook. Tap on the “number” icon in the lower left and you get a variety of options for navigation to a new website as shown on the right. I have had as many as ten tabs actively open. History goes back several days (but can be cleared). 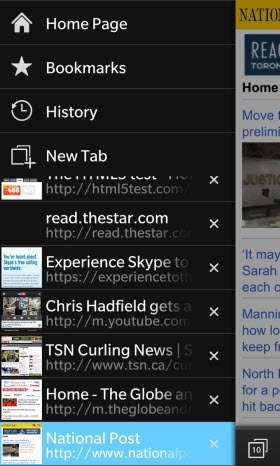 My Bookmarks are largely to sites for which we still await the BlackBerry 10 app. Frankly, I find it easier to work with PGATour.com on the BB10 browser than using the app on the iPhone. And there are several other examples where going the browser route gives me the information I see in other apps. It’s the speed of the browser that contributes to the success of this approach. But then there’s the Reader View – for websites that have not adopted Responsive Design. 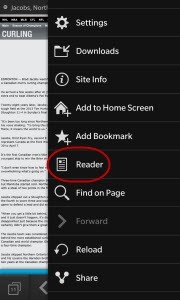 Select Reader Reader View brings up the main content in an easily readable format. Hopefully web designers will incorporate Responsive Design into their sites going forward. Looking at Toronto’s newspapers, the Globe and Mail and National Post both support Responsive Design with no need for using Reader View; however, the Toronto Star has not adopted it (they bring up great pictures but the text font is worse than the example above); one needs Reader View to be able to absorb the content readily. One feature associated with the browser has had significant use on my part. Share, discussed in the previous post in this series, allows me to quickly share a web page URL via Twitter, Facebook, SMS text message, BlackBerry Messenger or to open the web page on a Bluetooth connected PlayBook, amongst other options. While there are similar opportunities for sharing on other smartphones, it’s the entire Sharing Flow algorithm that makes it very easy (and quick) to Share on the BlackBerry 10. 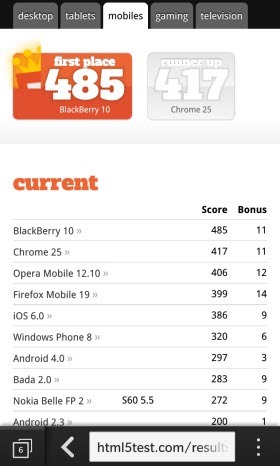 Bottom line: As mentioned above, the BlackBerry 10 browser is a significant improvement over those on legacy BlackBerry devices (other than the PlayBook which has similar speeds to the BlackBerry 10). It has basically turned browsing on a BlackBerry to the equivalent of browsing on a PC in terms of speed, performance and bringing up a broad range of web page formats, including those with plugin requirements. 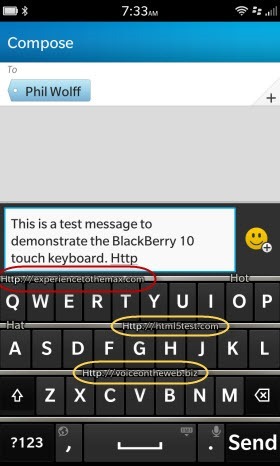 In closing, it’s not any one individual feature but rather the combination of the display, keyboard, browser and more that contribute to the overall speed of using the BlackBerry 10 and its claim to offer a new mobile computing experience. Did I say it was fast? 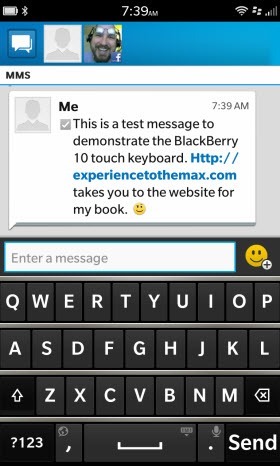 More to follow: The Hub, BlackBerry Messenger.